Ashbourne garden paving is available in a range of distinctive shades, which allows you to scope out patio ideas to make your garden personal to you. 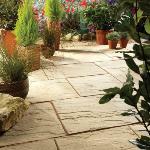 This garden paving product allows you to incorporate fettled edges, giving you a truly distinctive design solution. There’s two different sized patio packs plus a circle option, so whatever your tastes you’re sure to find paving to suit your garden needs!